Monochrome photograph of the departure of members of the Dornoch Company, 5th Seaforth TA to guard the oil tanks at Invergordon. The remainder of the company stayed in Dornoch for a further 6 months billeted in the Masonic hall. R to L: 2nd Lt Andrew Budge (killed in North Africa); Capt. 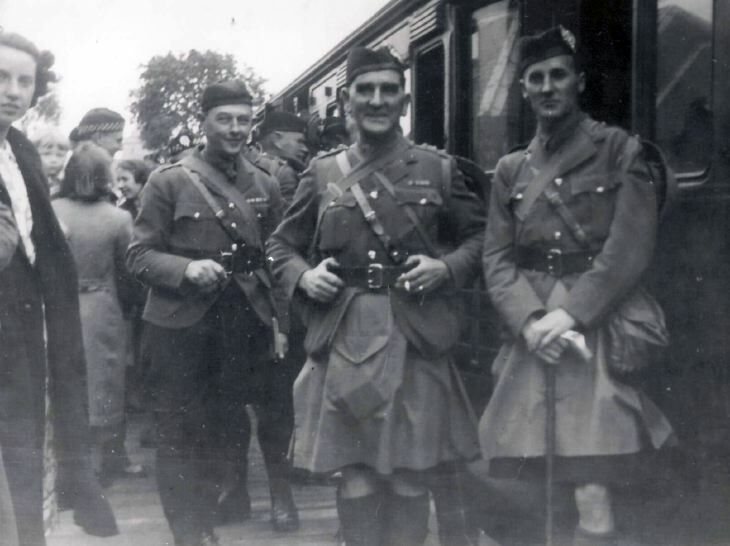 Jim Macdonald (wearing WW1 medal ribbons); Pipe Major Hugh Grant (over Capt Macdonald's shoulder), later head keeper at Skibo; Ruby Budge (on extreme R). Note kilt covers (function unknown). I'm very impressed by this collection by and large, but occasionally the year tends to be a bit out - in this case I think it should be 1939 rather than 1914, as at least two of those in this photo appear to have already collected their campaign ribbons for the 1914-18 War. "Note kilt covers (function unknown)". Kilt covers protected the kilt from dirt and wear and tear, it also meant the dark tartan was covered in a neutral khaki material. It would cover front and back. I am looking to put a face to a name. Can anyone help? My Grandad's brother, Private James Close, of the 4th Bn Seaforth Highlanders, died on 26/4/17 age 32 in 11 General Hosp. Camiers France. Buried in Etaples. He was from Belfast. I would be very grateful.